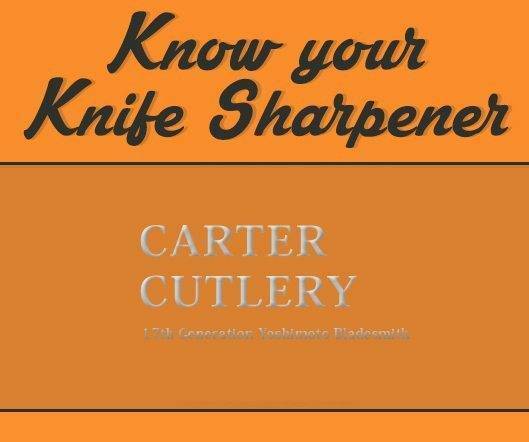 It’s a pleasure for us to have Murray Carter from Carter Cutlery on KnifePlanet. 1. Hello Murray, do you recall the first blade that you’ve ever sharpened? Yes. I was about 12 years old, and I tried to sharpen a folding pocket knife with an old worn out oilstone. 2. Have you been doing it for a long time? I have been sharpening knives professionally since 1989, and I have sharpened over 100,000 blades by hand. 3. What’s your sharpening technique? Can you tell us more about it? 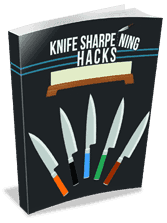 I popularized the 7 Step Procedure to knife sharpening, and it is highlighted in my world famous instructional DVD Blade Sharpening Fundamentals. The first step involves cleaning the knife thoroughly if it has been used extensively outdoors or in the kitchen. The second step is examining the blade for relative straightness; not only the straightness of the blade but the relationship of the blade to the handle. The third step is completely cerebral and involves formulating a plan of action. For example, does the tip need to be repaired or are there any chips in the edge of the blade? Does the blade’s profile need to be refined? And does the blade need to be thinned down (the secondary edge) for more efficient cutting performance? (Thinning of the secondary edge is usually necessary.) The fourth step is where the actual grinding starts and involves using a rough abrasive to thin down the secondary edge geometry of a blade. The fifth step involves establishing a new primary edge and grinding it to a “scary sharp” angle which can be tested using my patented “three finger test of edge sharpness,” which I demonstrate on YouTube. The sixth step involves polishing the secondary edge on a finer abrasive for rust prevention and improved friction coefficient for increased cutting performance. The seventh and last step involves stropping the primary edge backwards over the fine stone to produce what I coined as the “scary sharp” edge. 4. Do you remember your first challenge when you started sharpening knives? The biggest challenge was to have the patience to sharpen a blade at an acute enough angle in both the secondary and primary edge to achieve the sharpest geometry possible in any given blade. The plain and simple truth is sharpening knives properly by hand takes a lot of time. 5. Some beginners practice on cheap knives, would you recommend it? I have always believed that a beginner should practice with a high quality knife because only a blade of good metallurgy (hard blade) will produce the kind of results the sharpening student is looking for. If the goal is to achieve a “scary sharp” edge, the student must sharpen a blade capable of producing one, and softer blades are not capable of that. The misunderstanding is that a good quality knife will be ruined from amateur sharpening practice, but such is never the case. As students gain an understanding and mastery over sharpening, they will be able to refurbish the same knife at will. 6. What do you think is a common mistake beginners make? The most common mistake is not understanding the dynamic balance between both the secondary and primary edge of a blade. It is not their fault because almost all commercial sharpening systems neglect to emphasize the importance of thinning down the secondary edge of a blade to vastly improve its cutting performance. 7. Is your technique still improving? The beauty of sharpening by hand is that it never actually gets easier and always requires the sharpener’s 100% focus and attention to get the best results possible. This is why many people take up the pursuit of sharpening because it is very therapeutic insomuch as you cannot think of anything else while you are doing it. 8. How do you test the sharpness of your knives after you’re done? The most expedient way to test the sharpness of the primary edge is to do the “Three Finger Test for Edge Sharpness.” This test can be done multiple times throughout the sharpening process and is the final method of inspection after Step Seven in the Seven Step Sharpening Process. That being said, actually cutting with the blade as it was intended is the final word in cutting performance. 9. How do you feel about sharpening angles and their importance? 10. Are there some knives that you don’t like to sharpen? Any knife that is sold under the pretense of extreme wear resistance, such as the ZDP189 or VascoWear blades, are nearly impossible to sharpen by hand. I sometimes joke that the owners of these knives would be better served with a ceramic blade or diamond coated blade. It is not commonly known or understood that the primary requisite for a high performance knife is ease of maintenance, even before edge hardness and keenness. The Holy Grail in cutlery is a blade that only takes a few minutes to regrind and finish the secondary and primary edge and yet cuts flawlessly for hours on end. This is a great economy of effort. This is why I prefer to use the Hitachi White Steel, because it sharpens easily yet maintains an incredible edge. My last advice for those thinking about learning to sharpen by hand is save yourself a lot of time and effort and get my easy to watch and easy to understand instructional video for $25 as a digital download or $35 for a DVD. I’m so glad you interviewed Murray Carter, I have the utmost respect for him and would love to meet him but I am sure that won’t ever happen. Nothing he said in this interview surprised me, so this is very comforting. I feel sharper just reading what he has to say, he lives and breaths what I am obsessed with so I truly admire this man and is forward thinking approach to sharpening knives. Murray is three dimensional sharpener, he can make incredible knives, makes jaw dropping handles and then can sharpen them to a level that is beyond razor sharp. Way to go and thanks Roberto for finding Murray and thanks to Murray for taking the time to enlighten us. Respectfully, Peter Nowlan from Halifax. I just can´t say enough on how influenced I have been by following Murray´s way of thinking. I have his neck knives and they are just AWESOME in every sense. Japanese cutlery form my POV is just the best of the best. I know I will deffinately meet him some day before I die. If you want to meet him, just go to one of the many shows he attends. He usually demonstrates his sharpening techniques. Great knives I own several. Very sharp! Be careful when cleaning.